“…and they lived happily ever after” is 11×14, painted with sumi ink and Japanese watercolor on paper. Nice story. But closer to real life, I think the couple might be just as happy foregoing the fancy coach, the grand castle and all the expectations of a perfect fairy tale life. 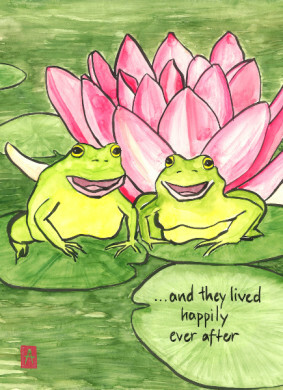 Instead, they could spend their time together as two frogs in a pond, catching flies in the sunshine and enjoying each day as it comes. For the past 21 years, I’ve been blessed to be married to a kind, brilliant, funny and warm-hearted man who is also my best friend. We don’t lead a fairy tale life—our Toyota and Subaru “coaches” both date from the last millennium, and we spent part of yesterday pulling weeds and scrubbing toilets. But we deeply appreciate each other and the sweet, everyday world of home and family we have built together. 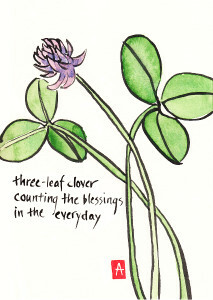 “three-leaf clover” is 5×7, painted with sumi ink and Japanese watercolor on paper. Published on DailyHaiga (Dec. 14, 2012). No prince or princess could ask for more. Savor the Day: There is a reception for my solo show this Saturday, August 2, 6-9 p.m. during Arts Alive at Humboldt Herbals in Eureka, CA. Seabury Gould and Frank Anderson will play old-style acoustic blues. There will be new cards, prints, and a 2015 16-month calendar for sale, plus free refreshments. The show runs through August. New cards: I’ve listed nine new card designs in my Makino Studios Etsy shop, plus the new 2015 calendar. North Country Fair: Humboldt folks, come celebrate the fall equinox at the 41st annual North Country Fair on the Arcata Plaza September 20 and 21. I'll have a Makino Studios booth on G Street near 9th. Feedback: I love to hear from my readers and I respond to every email or blog comment. Thanks for all the insights and encouragement after my last blog post, “Yeah, but is it art?” I look forward to exploring your reading suggestions on the nature of art and being an artist.